Experienced birder Sallie Wolfe provides a peek into her creative process, sharing notes, verses, sketches, and paintings from her own notebooks. A beautiful blend of factual information and creative inspiration offers birders and artists alike a giftable collection of poetry, a compact guide, and an invitation to journal. At first glance, The Robin Makes a Laughing Sound centers on bird identification and behavior. But look more carefully: journaling helps us observe, think evaluate record, and create. 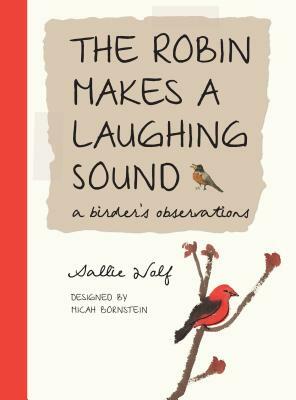 Sallie's words capture the light of early spring when robins return to newly budding trees, list the species that come and go, note how West Nile virus affects her backyard population, and even find a rhyme for suet—there's nothing to it. Sallie Wolf is a full-time writer and artist. She fills her journal with story ideas, some of which she turns into books like PETER'S TRUCK, TRUCK STUCK, and THE ROBIN MAKES A LAUGHING SOUND. She lives in Oak Park, Illinois, with her husband, Chuck. ♦ Wolf's journal/sketchbook is arranged in eight-page sections by season, each beginning with a list of avian visitors. The charming, eye-catching format includes short dated nature notes written in script, some of them on glued or taped-in torn paper pieces; other paper scraps contain short typeset poems and small, labled watercolors: an object; a single flower; a bird; a tree in seasonal array. Notes for several poems, showing words or phrases that have been crossed out and changed, are written beside the finished piece. Pen-and-ink sketches capture a baby house sparrow, a V-formation of geese, a downy woodpecker at a suet feeder, and more. Two pages of author's notes explain how Wolf became interested in birds as a result of seventh-grade project, and how she developed her journaling style. A page of resources includes several outstanding Web sites, some top-notch guides, and books on birding. This small, instructional guide may provide the inspiration for young authors with even a bit of artistic talent ot begin keeping nature journals of their own. This journal strikes a pensive and tranquil note, emphasizing the simple joys to be found in observing nature, birds in particular, rather than providing specific tactics for identifying species. Cursive lists of North American birds appear under a heading for each season, followed by a collage of bird sketches in ink and watercolor, journal entries, and careful observations that take the form of tender, sometimes surprising poems: "A pair of nutchatches used to visit my feeder ever day./ That was before West Nile virus/ spread from bird to bird." It should find an audience in nature-lovers, writers, and other contemplative readers. Longtime bird enthusiast Wolf observes, sketches, paints and writes poems about the robins, juncos, wrens and cardinals that venture near her Illinois home. Here, bits of her original birder's journal are digitally manipulated with simulated torn pieces of paper and adhesive tape to create a clean, inviting scrapbook look. A spread entitled "Spring" features a list of species spotted, a lovely watercolor-and-ink sketch of a crocus, a list of warbler characteristics and a haiku about brown creepers. Thoughtful questions ("February 19—Where do birds sleep at night?") and brief cursive notes ("May 2—The black cap sits on its head like a black beret") pepper the pages, and the winsome poems range from nursery-rhyme style ("Flippy-floppy, splishy-sploshy— / robins take a bath. / One bird, two birds, three birds, four— / it's crowded. Splishy-splash!") to more matter-of-fact free-verse observations of bird behavior. The journal's most charming aspects, however, are the artful sketches and watercolor paintings—and the endearingly childlike sense of wonder reflected throughout.